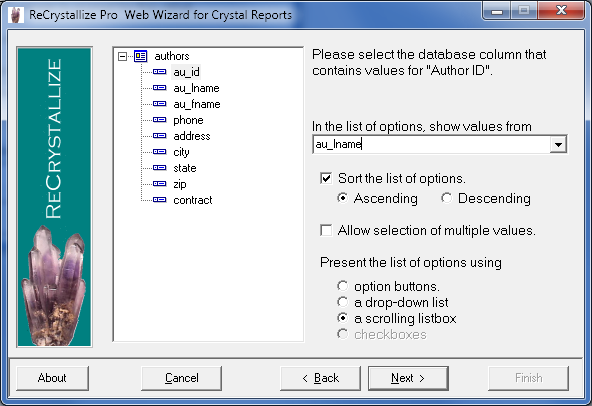 ReCrystallize Pro's interview process makes it easy to select options and publish your Crystal Reports on the web. 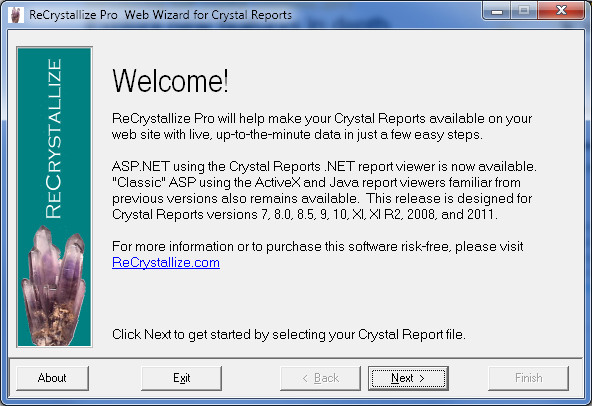 The screen images below and the ReCrystallize Pro videos help show the simple process of creating ASP or ASP.NET web pages that will let users view your Crystal Reports in a web browser with live, up-to-date data from your database. 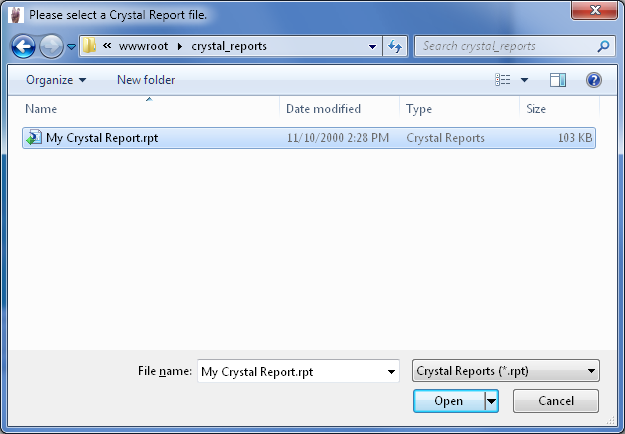 Begin by selecting your Crystal Report file. 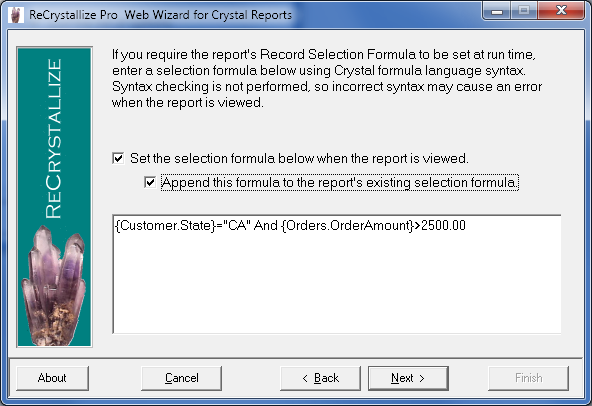 Next, select the Crystal Reports version and choose ASP.NET or classic ASP web pages for your report. 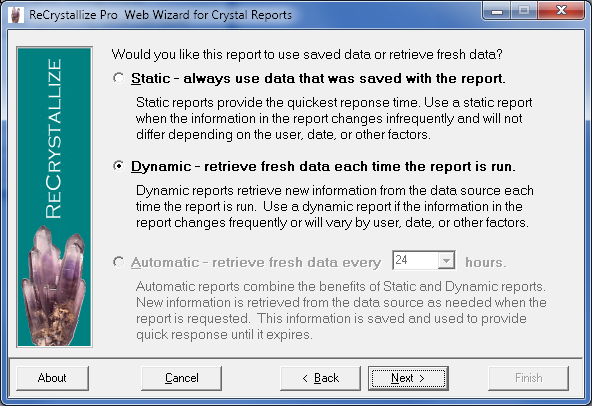 Choose to isplay data that was saved in the Crystal Report file or to retrieve new information from your database each time the report is run. If you have selected to run your report with live data, provide database connection details. 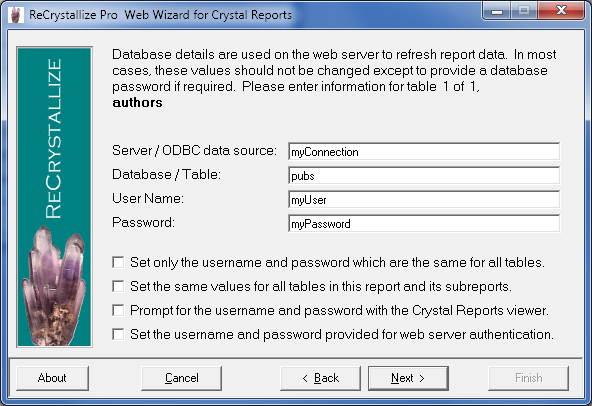 The database credentials are used securely on the web server to connect to the database. They are not transmitted to the client web browser. This example shows database connection details for a typical SQL Server database. 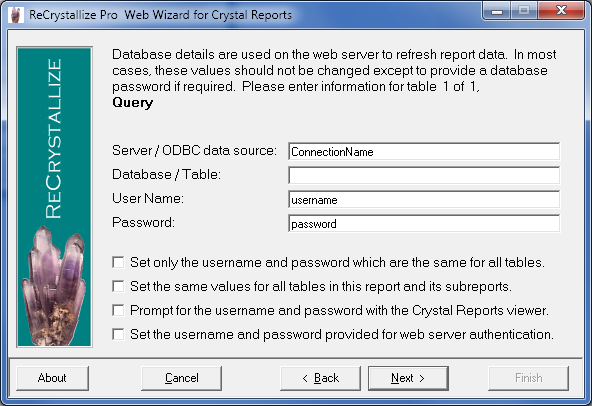 Most other database types that can use ODBC or a native Crystal Reports driver, including Oracle and Access, are supported. When using live data, choose how you would like to set each of your report parameters. 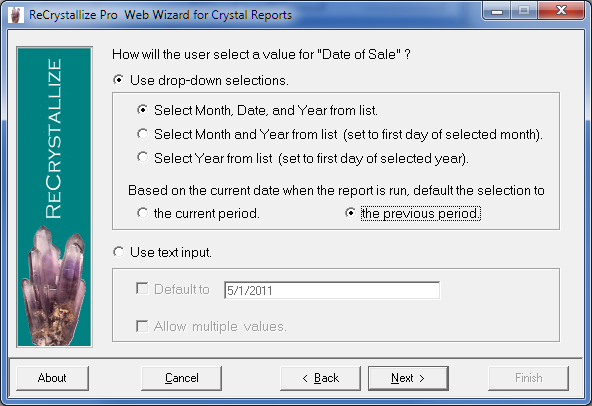 Values such as the current date or current user name can be supplied automatically. 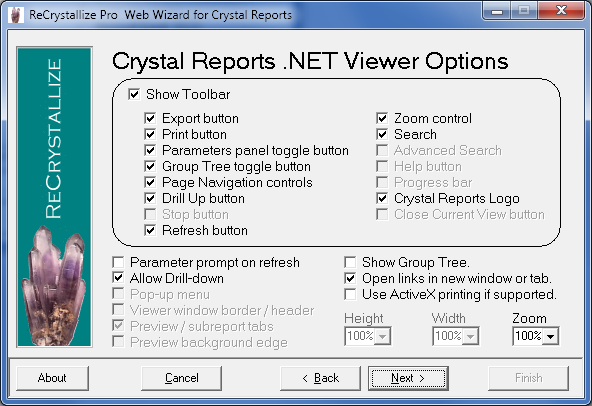 If using ASP.NET, you can use Crystal Reports .NET viewer for prompts that appear and behave similarly to those in the Crystal Reports designer. When using ASP.NET or classic ASP, ReCrystallize Pro can create a parameter input form which can be easily customized to blend with your existing web site. Users can select a parameter value by choosing from a list of values in your database. This ensures that your parameter selection options are up-to-date and prevents errors or misspellings. 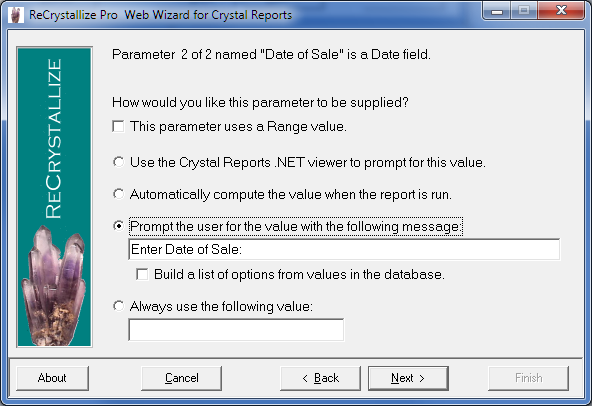 When required, ReCrystallize Pro will produce a web page with a form that allows users to select parameter values. These web pages may be easily customized. The parameter form may be bypassed by passing parameter values in the URL. 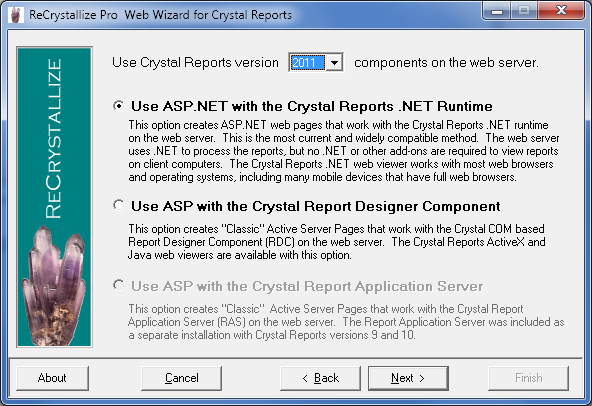 The Crystal Reports .NET Report Viewer works with most web browsers, including many mobile devices such as iPhone, iPad, and Android devices. 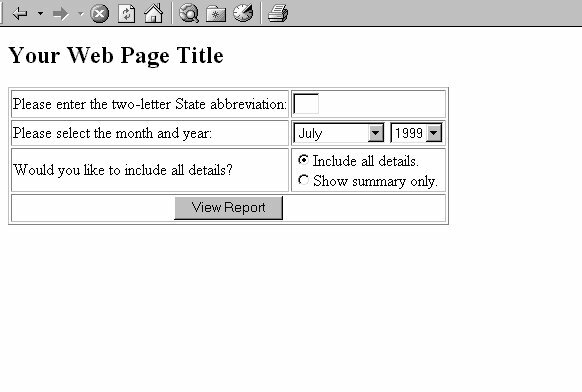 ActiveX and Java viewers are available when using classic ASP. Reports may be downloaded directly to PDF, Excel, and other file formats. Select which viewer options and controls to enable. For example, printing or saving the full report could be disallowed by disabling the viewer's Print and Export buttons. 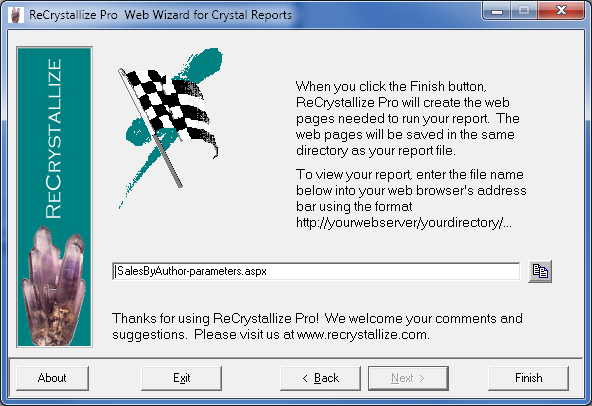 When you click Finish, ReCrystallize Pro creates web pages to run your report.